Activator: Oxidizer added to increase strength by adding hydrogen peroxide. Ammonia: Active in opening up cuticles to allow the color molecules to penetrate into cortex. The higher the ammonia level, the more the cuticle is opened. directly on hair to enhance a style or for in-between highlight touch-ups. Base color: Dominant tone of hair. Booking time: Time needed for salon service. Brighten/intensify: To lighten half a layer and deposit a complimentary tone. Generally with demi-permanent color or soft highlights. Color Type: The color that most compliments your skin. Warm/Autumn: Warm with gold and orange undertones. Earth tones. Combination of primary colors: yellow and red that make gold. Cool/Summer: Soft, cool with violet blue undertones. Combination of primary colors: blue and red. Winter: Vivid clear and icy with pure blue undertones. hair pigment lost due to sun or prior colorings, to create even shading prior to color. Colorist: Person trained to apply hair color. (ie. yellow would be a complimentary color to gold). Evenness of tone or hair color. Thickness or viscosity of color product applied. hair is lightened. It can also be called an undertone. is approximately 70%, semi-permanent is 50% coverage. Cuticles: The first of three layers in the hair. used mostly to deposit color. Also used to lighten hair for shading. Developer: Oxidizing agent added to hair color to develop color molecules and create a color change in the hair. It is generally 20 volume for permanent, 5 volume for demi-permanent. alters the way we see ourselves or how we are seen. prelightening of the hair, 2) depositing of color and tone. Duration (color duration): The amount of time a color lasts. changing the hair color in lightness, brightness or tone. Features: Bone structure, eyes, mouth, neck, cheekbones, etc. that hair stylists want to draw attention to. separate from the rest of hair, used to lighten and enhance styles and overall color. Formula: Color or combination of colors used in dyeing hair. Frequency (Frequency of Application): The average time in between coloring. Hair color: Color of hair created by nature. Haircolor: Professional term referring to artificial hair color products and services. bringing the hair to a lighter level. illusion of sheen and depth and create movement. Intensity (color intensity): Strength of color tone. three primary colors-yellow, blue, and red. Lightness: Products with chemicals used to decolorize or lighten the hair. out, separating colored hair from new growth. Maximum Lift: The amount of lightening possible in different hair coloring techniques. For example, single process has four levels of lift, demi-permanent has a half level of lift, double-process can lighten hair ten levels. Medulla: The center of the hair shaft. in after the hair is colored. ear to test for sensitivity or allergies to any product used on thescalp. three levels of the hair shaft. creates a sustained change in the hair and penetrates all three layers of the hair. to enhance lightening and oxidation in the hair shaft to remove hair color or deoxidize the hair. Pigment: Melanin Protein bonds found in the cortex (the middle layer of the hair) that gives hair its color. Primary colors: Red, yellow, and blue. All colors are created from these three. that compliment your skin to make it look its best. Yellow: spring; gold/red/yellow combination: autumn; blue: winter; blue/red combination: summer. Resistant: Stubbornness in hair, which inhibits penetration of products or chemicals, limiting the change or slowing the process of hair coloring. This can also occur from the over-coloring or over-depositing of hair color. Secondary colors: They are created by adding equal parts of one primary color to another primary color. Semi-Permanent: Hair color that partially penetrates the cuticle and is partially washed out after each shampoo. Shade: An increment of measure in each level of hair color. There are 4 shades in each level. 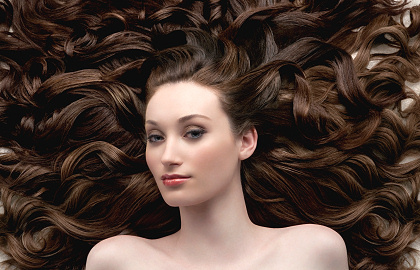 Single-process hair color: Refers to coloring that colors and or lightens hair in one step. Soften: To lighten hair less than one level. Sun-kissed: Highlighting created by the sun or subtle highlights imitating those created by the sun. Technique or special effects hair color: Form of application, such as balayage, foil, or single-process. Temporary Color: Non-permanent color that doesn’t penetrate the cuticle, allowing it to be removed by shampoo. Tertiary colors: Combination of primary and secondary colors, such as red and green (mixture of yellow and blue). Tone: The warmth or coolness of the hair. shades and levels of hair. Touch up: The application of hair color to re-growth. generally a combination of highlights and lightening or darkening. Virgin application: First time hair is tinted. Weaving: When you separate strands, apply color to them and keep them separate from the rest of the hair.